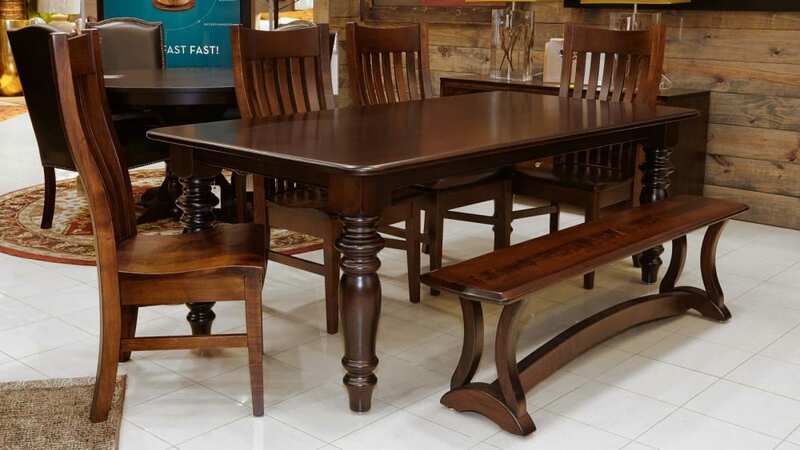 Create a distinctive dining experience by having your family gather around this incredibly beautiful solid maple wood dining set. Master artisans in the heartland of America put countless hours into making these heirloom-quality pieces of furniture. From holiday feasts to quiet romantic evenings, this set creates a stage for memorable moments and joyous occasions. Solid maple wood is used to astonishing effect, making the table, chairs, and bench beautiful and unique. Eye-catching details create an intriguing appearance. Proprietary catalyzed finishes are applied to seal the wood, protecting it from wear and tear. The bench offers a traditional, yet offbeat options to mix up how you take your meals.